Since I’ve been unable to post for a few days, I have some catching up to do. Wednesday and Thursday both were lots of driving through Illinois, and then Iowa, Minnesota, and South Dakota. Wednesday we had our first camping adventure next to a corn field off Rock Island State Trail in Illinois where we were serenaded by cows throughout the night. Who knew cows were so active at night? 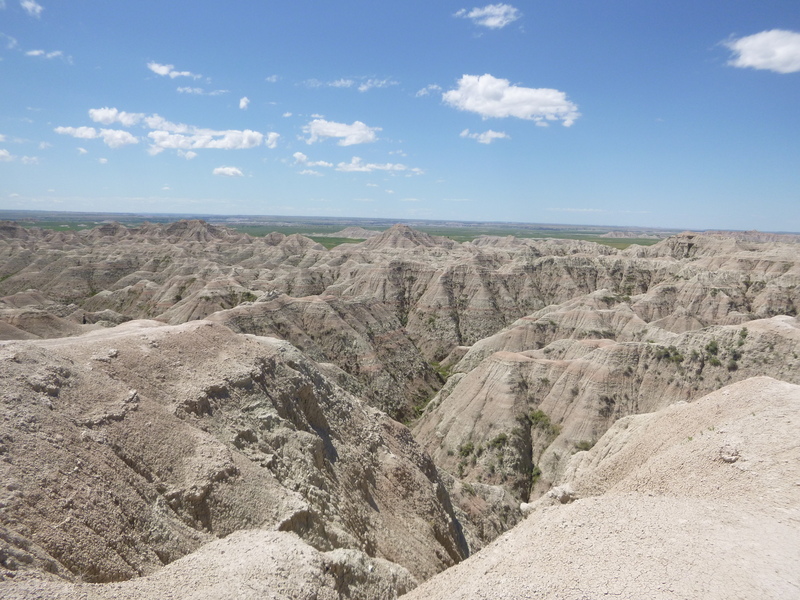 Thursday brought spectacularly flat, green landscapes through the Midwest and the rolling hills of South Dakota, all with plenty of sunshine and blue skies. Our journey has also brought us past the SPAM museum (Minnesota) and the Corn Palace (South Dakota), neither of which we stopped at, but also the Six Ton Prairie Dog which stood guard at the entrance of a viewing area for real-life prairie dogs. 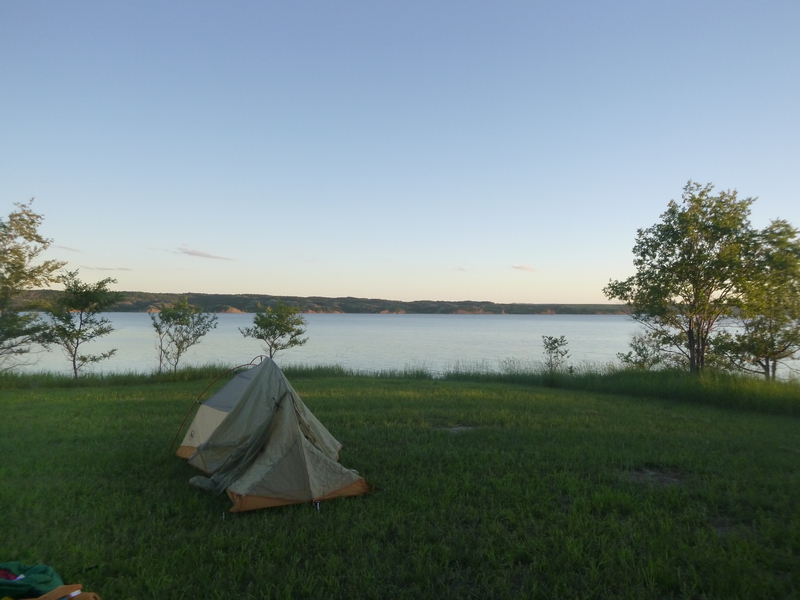 On Thursday we camped near Lake Sharpe where the landscape changed from dry prairie to dramatic hills and overlooking the Missouri River. The campsite itself was nearly empty and had spectacular views but also access to our own private swimming beach, which we availed ourselves of. 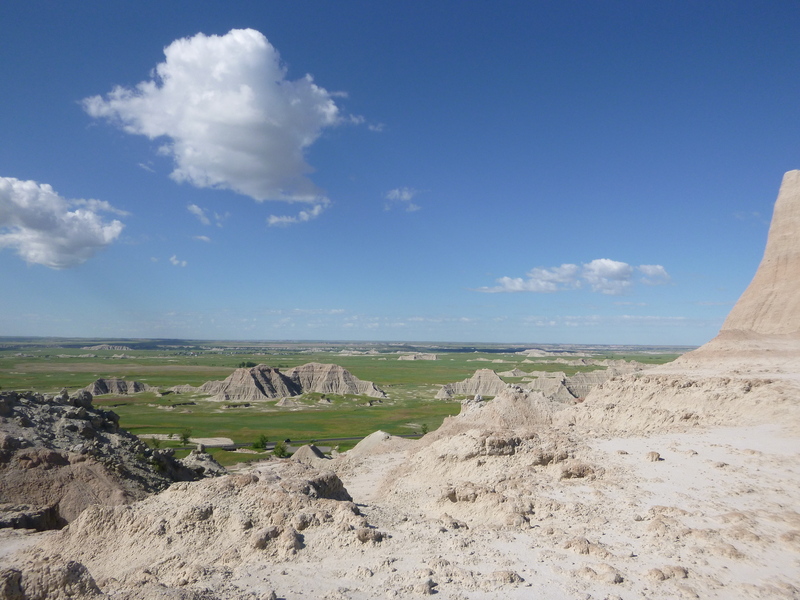 Finally, Friday we headed to Badlands, stopping at some scenic viewpoints and short trails before setting off into backcountry along the Castle Trail at midday. Our campsite that night was nestled next to an eroding mountain, completely isolated from anything but the sounds of distant coyotes, buzzing insects, and swooping bats. 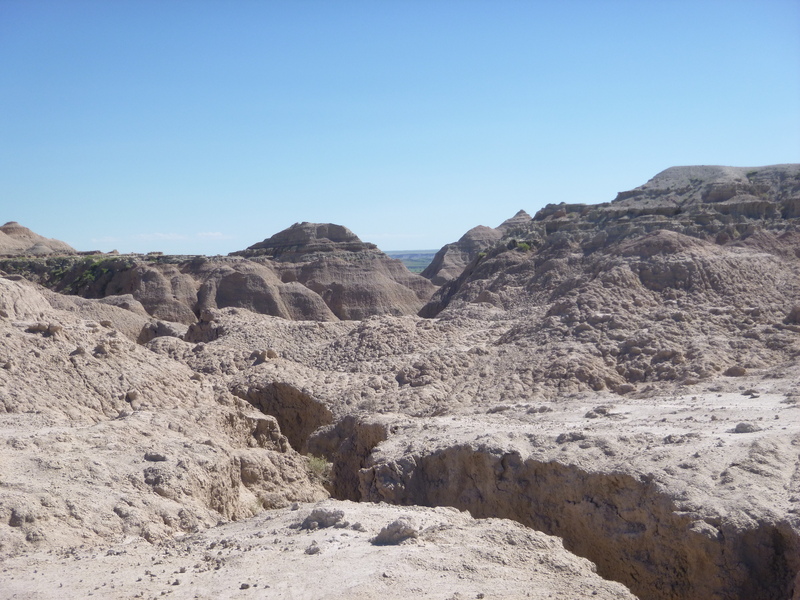 Without any ambient light, we were able to see thousands of stars bright in the sky which illuminated the striated rocks of the canyon walls and the cracked clay floor around our campsite. We hiked out this morning veering off to Saddle Pass where we looked down on the valley of the canyons of above, and then took the alternate Medicine Root Trail before connecting back to Castle Trail and finally, the car. Leaving the park along the scenic byway, we viewed dramatic rises of rock, some stained yellow and red, and more sod-topped mesas scattered through the landscape. It’s been spectacular so far! Next stop will be Mount Rushmore Sunday morning and then Wind Cave National Park. The story and the pictures are AMAZING! Glad to hear the drive on your way to South Dakoka went well! Those cows must have been practising their hit song. Ending your evening after the hike by gazing at the many stars across the night sky, twinkling away would have made for a peaceful sleep. Was it cooler at night at the isolated campsite? 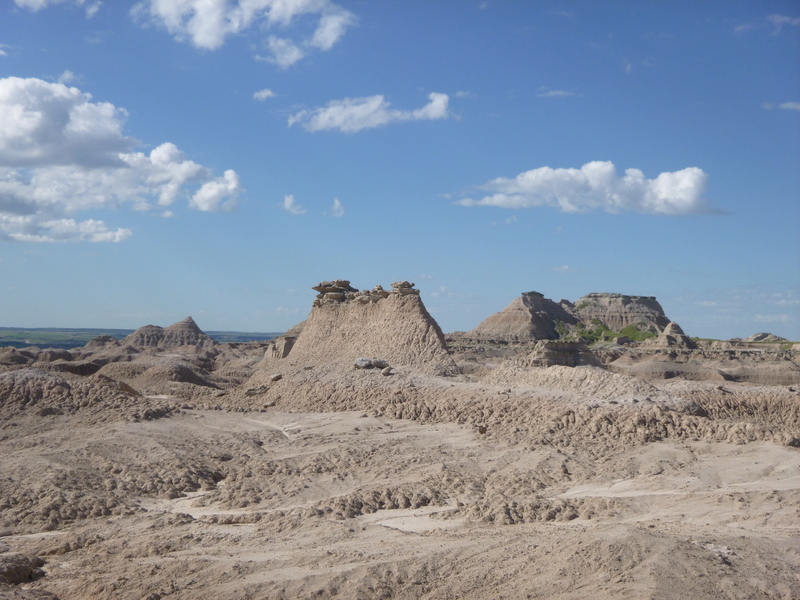 Any amenities or water pumps or ismthisnstraight out bring your own supplies hike in this badlands? The pictures are spectacular to see. 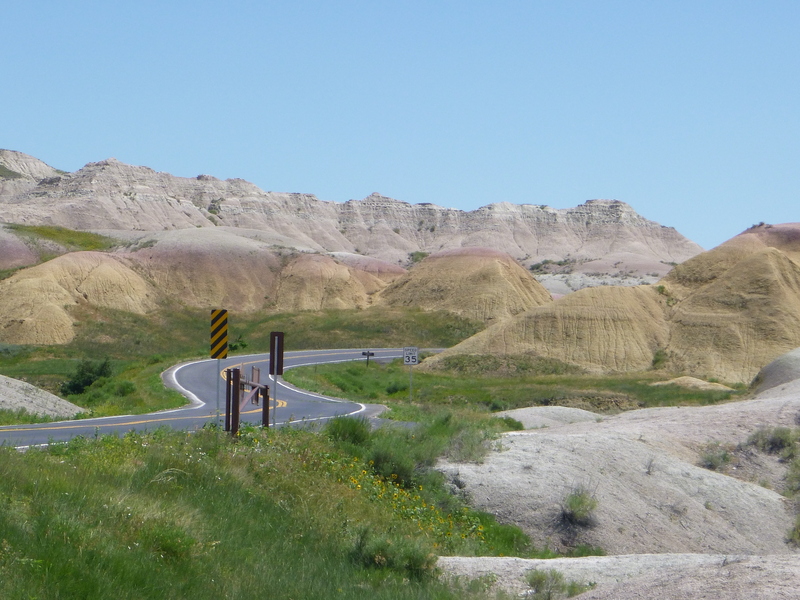 The badlands area looks unreal yet truly fascinating. It would have been hard to not stay in one spot for a day or two just to soak in the sceney. Thanks for taking the time to share your adventure so far. Have your own swimming beach score at the campsite… Hot dang girl, that’s the life! It tends to be cooler at night for sure but the greater altitude we are, the colder it gets. Most of our campsites have been without water or amenities since they’re all been free but twice we’ve camped near trailheads or in a free camp ground where there have been pit toilets. 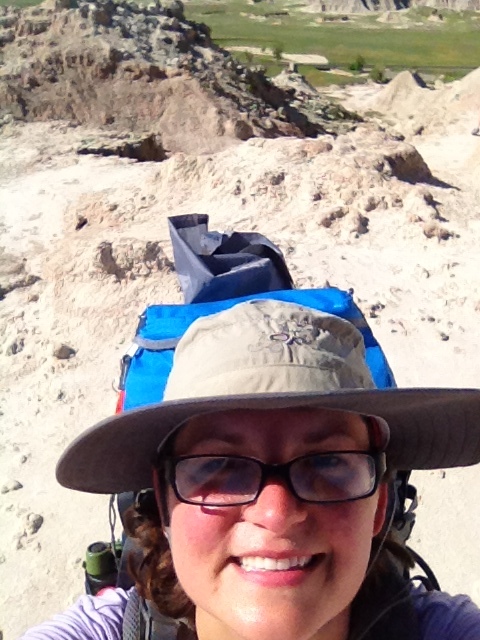 When we’re backpacking like in the Badlands, we had to carry everything we needed. Once we get to places with water we’ll be able to filter water as we travel. Thanks for reading! Looks like some amazing photos! Loud insomniac cows? Who knew? That’s a deep canyon. Nice.